One of the suspects, pictured here in a video released by the Philadelphia Police Department. The Philadelphia FBI/PPD Violent Crimes Task Force believes human remains found in Maryland are from a man abducted in June from North Philadelphia, and they are asking the public's assistance in identifying two potential suspects. Formal confirmation via DNA testing is still pending, but the FBI says the family of the man, Luis Alejandro Chueder Ramon, has been informed by the Violent Crimes Task Force that dental records and other evidence suggest the remains are his. According to the FBI, his death appears to have been a homicide. In the video, one man is seen removing a child’s seat from a VW Passat and putting it in the trunk. Another man places what appear to be clothing in the trunk. There is also a driver in the car, who briefly opens the door but does not show identify himself. 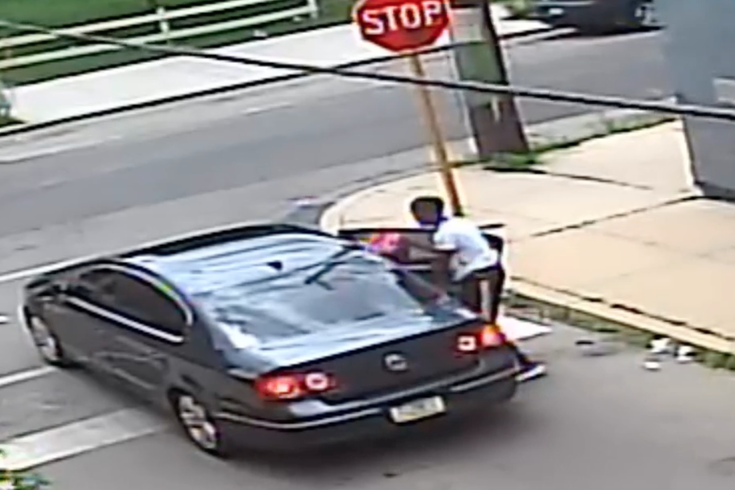 Police believe the men in the video have ties to the Philadelphia and/or Norristown areas. They are considered armed and dangerous, according to police. The Philadelphia FBI is asking anyone with helpful information to contact the Violent Crimes Task Force at 215-418-4000, or at tips.fbi.gov.